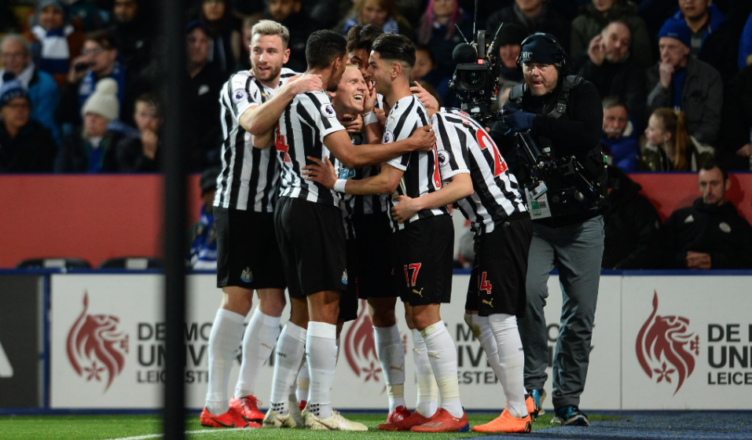 PLAYER RATINGS: Leicester 0-1 Newcastle – 7’s, 8’s and THREE outstanding 9’s – NUFC blog – Newcastle United blog – NUFC Fixtures, News and Forum. A huge effort from all involved and a well deserved win to practically secure our Premier League status, with Ayoze Perez’s brilliant header being enough to give us all three points. 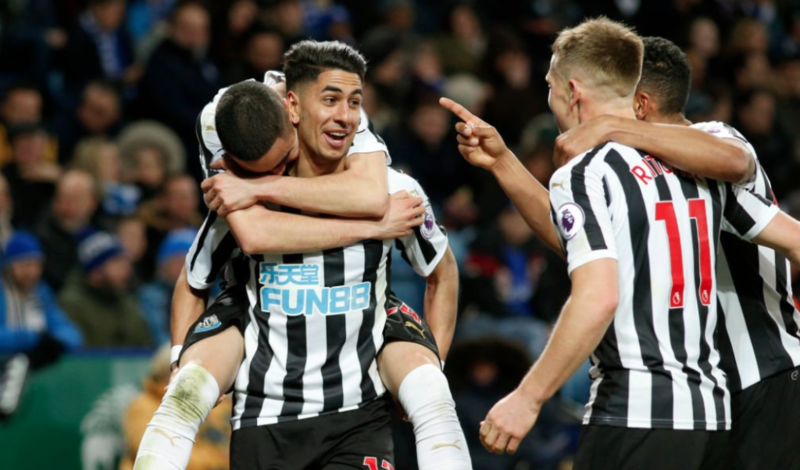 NUFC XI – (5-2-2-1): Dubravka (7) – Manquillo (7.5), Schar (9), Lascelles (8), Dummett (7), Ritchie (9) – Hayden (7.5) , Ki (7) –– Perez (9*), Almiron (8) – Rondon (8.5) – SUBS – Atsu (6), Diame (N/A). Dubravka – 7 – Made a decent early stop to deny Chilwell low down to his left and was quick off his line to gather any loose balls. A deserved clean sheet after late heartbreak last weekend. Manquillo – 7.5 – Did a very solid job to limit both Barnes and Chilwell down Leicester’s left. Could’ve cost us late on with a risky pull at Tielemans, but stood up to the test well, making several well timed interventions to cut out the danger quickly. A solid and committed performance. Schar – 9 – Read the play superbly, constantly nipping in to cut out any balls into Jamie Vardy and Harvey Barnes. Defended admirably from the first minute to the last and continued to step out of defence expertly, going on one incredible 60-yard run that could’ve lead to a spectacular assist if Almiron had his shooting boots on. Another hugely impressive display – a joy to watch. Lascelles – 8 – Plenty clearances and headers away from danger when Leicester whipped balls into the box from open play and set pieces. His pace came in handy when tracking the runs of Vardy and Barnes. A commanding performance which will do him the world of good after the odd shaky display of late. Dummett – 7 – Put in some strong challenges and read the play pretty well, covering out wide to track Gray when Ritchie was caught slightly out of position. A few scruffy half clearances but a solid showing nonetheless, proving he’s more than capable of slotting into the left side of a three-man defence. Ritchie – 9 – Played a huge part in our goal, reacting quickly to a loose ball, selling Pereira a dummy and whipping in a great cross which Perez connected with perfectly. He was caught out positionally early on but quickly recovered and put in a strong showing at both ends. His delivery and defensive work has been questioned in recent weeks, but both were spot on tonight. Hayden – 8 – Combative as ever, playing the spoiler role well along side the more ball-playing Ki. He was a little wasteful at times and it wasn’t always pretty, but his presence, fight and energy in the middle was invaluable for us once again. He will take some replacing this summer on this form – something I didn’t expect to say just six months ago! Ki – 7 – Wriggled his way out of some tight situations nicely, carried the ball well and was the one man looking to create from the middle. He had mixed success with some long balls into wide areas but generally used the ball well, helping us get decent balls into the front three. Sometimes feel like he needs to be a little stronger in the challenge, but he did a very good job and did well to continue after an awful late challenge from Tielemans early on. Perez – 9* – Scored the winner with an absolutely brilliant glancing header, showing fantastic movement and real quality with his finish. Grew into the game from that point, linking up nicely with Rondon and causing problems with his movement and invention. Pulled off one sublime piece of skill to skin Chilwell and very nearly made it two if it wasn’t for smart save from Schmeichel, also helping relieve the pressure on our defence late on with a few mazy runs. My man of the match, both for his superb goal, intelligent use of the ball and tireless work off the ball. Almiron – 8 – The Paraguayan set the tone for what was to be a full blooded and energetic performance all over the pitch. He was full of energy and enthusiasm at both ends and never stopped – whether it was his tracking back, his movement in attacking areas or his determination to score or assist in the final third. His final ball or finish was a little erratic at times, suggesting he needs to curb his enthusiasm to some extent in the final third, but his energy and attacking intent is brilliant to watch. He’s almost too quick for his own good at times – a lack of composure sometimes undoes his good work – however he looks absolutely perfect for this system and will only get better. Rondon – 8.5 – Played the lone striker role expertly up against two heavyweights in Maguire and Morgan, battling for everything, chasing balls most strikers would see as a lost cause, making good runs and winning some clever few flick ons. Smashed the corner of the cross-bar with an almost inch perfect free kick in the first half and linked up with both Perez and Almiron intelligently. Another huge shift to remind us all how important it is he signs permanently this summer. Atsu – 6 – Gave us pace on the break and something for Leicester to think about just as they wanted to pour forward late on. Battled away and worked hard. Diame – N/A – Not on long but screened the back four, got stuck in and won a few big headers to relieve the pressure on our defence late on. Now needs TWO starts in our last FOUR games to activate a one-year contract extension. Olly, So Perez scored the games first goal?